"Every Industry Has Its Leader"
Our third generation barrier designed for cost-effectiveness, strength and durability. Features an incredible 7,300kg breaking strength horizontally and vertically. 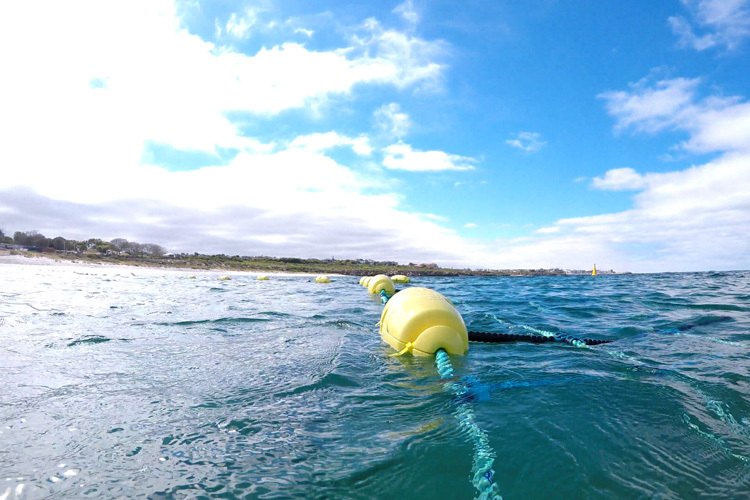 Our second generation barrier, the Bionic Barrier, may be preferred for areas with large tidal ranges. The barrier has unique hinges that allow it to rise and fall neatly. The Swimsure is a personal enclosure for boat owners. The Swimsure is produced by an independent partner company with Global Marine Enclosures barrier technology. WE PRESERVE LIFE THROUGH ECO-FRIENDLY PROTECTIVE MARINE BARRIERS. Shark fears are having a real impact on people's behaviour. Less and less people are out enjoying the ocean; swimming, surfing and other water activities. It is important to protect people at our beaches. We believe that this can, and must, be done in an environmentally friendly and non-intrusive way. We are an innovation company. We wanted to create a solution that actually protected people swimming at beaches; without harming marine creatures. So we started to develop eco-friendly shark barrier technology. We have now reached our third generation shark barrier product - the Aquarius Barrier - which provides a eco-friendly alternative for shark mitigation that is advanced in swimmer safety, environmental impact, operational requirements, and cost-effectiveness.